July 14, 2017 To celebrate the 100th competition, a new wallpaper is created by Xiaomao. Click here to download the wallpaper. July 4, 2017 To celebrate the 100th competition, we present a SPECIAL level - a hundred flowers bloom - at http://sokoban.org. March 27, 2017 One of the organizers of the MF8 Sokoban Competition, Dr. Chao Yang, has just published an academic article about the computational complexity of a Sokoban-like puzzle, in the journal Theoretical Computer Science. See here for more information. April 15, 2016 推箱子比赛七周年。7th anniversary of MF8 Sokoban Competition. Mar 30, 2013 SokoPlayer HTML5 updated. Faster path-finding algorithm. Jan 29, 2013 Starting from the 43rd competition, we will have two levels for each competition. Players can submit solutions to either or both of the levels. Dec 27, 2012 We added yet another domain name http://sokoban.org for our site. Dec 5, 2012 Reverse Mode has been added to SokoPlayer HTML5. Nov 16, 2012 A new Sokoban program sokoban.py is released. We begin using the domain name http://sokoban.cn, and sokoban.ws will continue to work. August 30, 2012 HTML5 地理小测验新增加拿大。 Can you name all the provinces and territories of Canada? August 22, 2012 A Chrome extension for SokoPlayer HTML5 has been released. August 20, 2012 SokoPlayer HTML5 extension for Firefox browser. With this extension, you can copy an XSB level from webpages (at forums or in web mails) into the online SokoPlayer HTML5 directly. Install this extension from the official Add-ons for Firefox, or from our site. See also the screenshot here. July 20, 2012 SokoPlayer HTML5 updated. Two buttons are added for the edit mode to clear targets and clear boxes, respectively. July 17, 2012 SokoPlayer HTML5 updated. A 'Send Email' button is added. On click, it will open your default email client to write a new email, with the email body filled with the current level and solution, and the subject filled with '[SokoPlayer HTML5]'. You can also set the recipient. To do this, input the email address to the big textarea and click the '@' button to the right of the 'Send Email' button. You only need to set the email address once, and it will be always used as recipient after that unless you reset it. July 13, 2012 USokoban 0.0.12 released. Compress the solutions using zlib before saving to the database. July 11, 2012 USokoban 0.0.11 released. Simple solution management is added with the help of SQLite library. July 9, 2012 SokoPlayer HTML5 updated. Using the HTML5 'audio' tag, sound effect is added. Check the 'sound' checkbox to enable the sound effect. Whenever you solve a level, the 'ovation' sound is played. When you click a floor square that the pusher cannot move to, or the selected box cannot be pushed to, the 'uhoh' sound is played. June 17, 2012 Soko++ by Joris Wit, the best Sokoban App for Android, is updated to version 1.6. Download it from the official Google Play, or from the mirror of this site. May 29, 2012 I have verified that USokoban can be compiled from source code for the PC-BSD/FreeBSD operating system almost without any modifications. May 14, 2012 SokoPlayer HTML5 updated. Use CTRL + mouse to select a rectangle block in the play mode, the program will count the number of boxes and goals in the selected block, and show them above the level. Please note that you may need to refresh/reload the webpage to make sure the browser fetches the updated files from the server. Feb. 27, 2012 As a by-product of SokoPlayer HTML5, I made a casual game called SokoLines HTML5. Feb. 18, 2012 On the Past Competitions page, you can get the best solutions for a past competition level, if you provide a solution for that level in the query form. Feb. 13, 2012 USokoban 0.0.10 released. Most of this update is contributed by Debian Developer Julian Gilbey. Feb. 09, 2012 SokoPlayer HTML5 updated. Use HTML5 localStorage to save settings, levels and solutions. Use HTML5 File API to open local level files. Try the go-thru function with these two levels, make sure the 'Go-Thru' checkbox is checked to activate this function. Jan. 30, 2012 SokoPlayer HTML5 updated. Several new features added: [Edit Mode] (1) selected block can be dragged, rotated or mirrored before pasting, (2) unlimited undos, (3) merge paste, [Player Mode] instant move. Jan. 18, 2012 SokoPlayer HTML5 updated. SokoEditor has been merged into SokoPlayer, so switching between game mode and edit mode is easy. Jan. 14, 2012 As the 31st competition level is the biggest ever, the submission deadline is extended to Feb. 13, 2012. Jan. 12, 2012 SokoPlayer HTML5 updated. Share a level playable online with your friends with simply a link. Click here for more information. Jan. 9, 2012 A wallpaper dedicated for sokoban.ws is available for download in different resolutions. Dec. 26, 2011 We are working on automatically sending solutions to all participants when competition ends. I apologize if you receive duplicate emails. Also, if you submitted a solution to the 30th competition with your email address attached, but didn't receive an email of solutions, please let us know. Thank you. Nov. 25, 2011 The 30th competition is to celebrate the 8th anniversary of the MF8 forum. 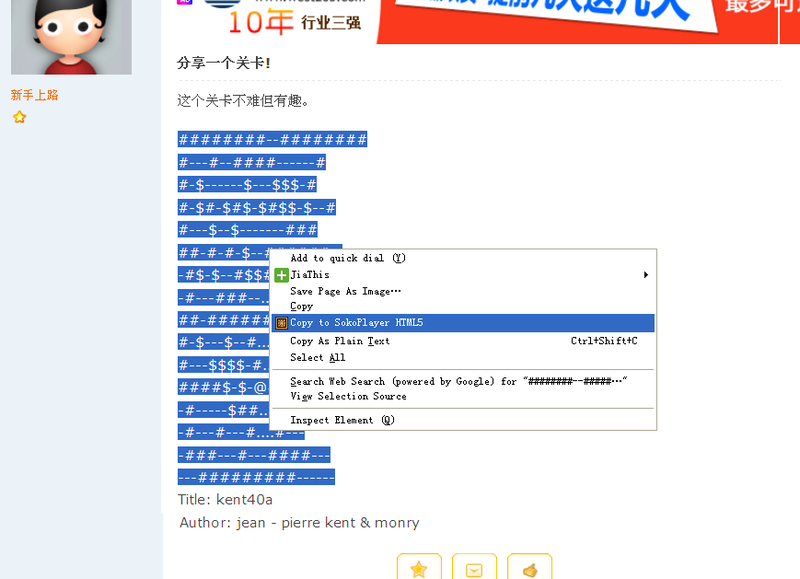 Nov. 8, 2011 SokoFind v2.0 RC2 released. Oct. 17, 2011 SokoFind v1.3b released. Oct. 15, 2011 SokoFind v1.3 released. Oct. 7, 2011 SokoFind v1.1b released. Sep. 30, 2011 To keep the playing value of the competition levels, we decided not to show the LURD solutions when a competition ends. You can send an email to stopheart, anian or Yang Chao for the solutions. Aug. 20, 2011 The source code for USokoban is available for download.